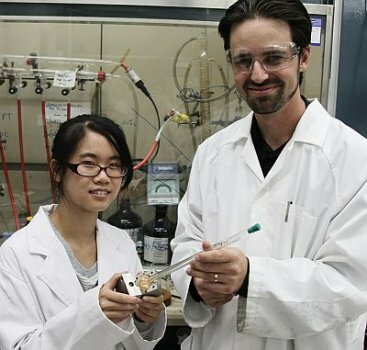 A new ‘solar sponge’ approach to capturing and recycling carbon dioxide uses solar energy, eliminating the need to heat the capture material to release the carbon dioxide. Metal organic frameworks (MOFs) are ultraporous materials that can store huge volumes of carbon dioxide, hydrogen or methane. Their amazing storage capacity is due to a periodic, open structure of small clusters of metal atoms linked by rigid organic molecules that creates internal surface areas as high as 6000 square metres (the size of a football field) per gram of material. MOFs have applications or potential applications in the automotive industry and in clean-energy and energy-efficient technologies. 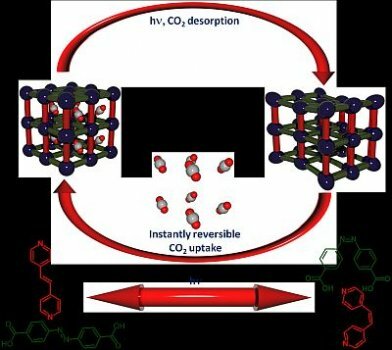 The new carbon dioxide capture method involves filling the MOFs with light-responsive azobenzene molecules that react to UV light. 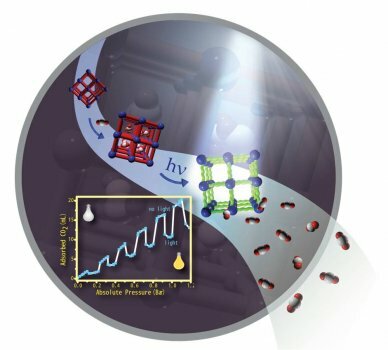 The MOFs soak up carbon dioxide – much like a sponge soaks up water – and then release the carbon dioxide when triggered by UV light (like wringing out a sponge). Using the solar sponge material to remove flue gases at coal-fired power stations would save energy compared to traditional processes, where releasing the carbon dioxide for other uses can consume as much as 30 per cent of a power station’s production capacity. The method was developed by a CSIRO team headed by Matthew Hill. Matthew and his colleague Richelle Lyndon (photo above), a student at Monash University, used powder diffraction at the Australian Synchrotron to help them assess their MOF structures. Use the following links to find out more about MOFs and the Australian Synchrotron.